Fair Isle knitting became popular in 1921 when the Prince of Wales wore Fair Isle tank tops in public (Fair Isle is a tiny island in the north of Scotland). 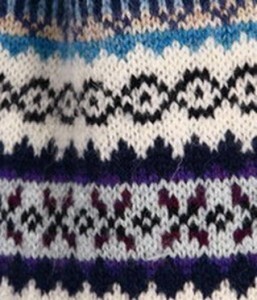 The Fair Isle technique refers to color work where stitches are knit alternately in various colors. We’ve all seen Fair Isle style on ski sweaters, scarves, mittens, etc. with their intricate patterns and vibrant colors. There are an infinite number of patterns that can be incorporated into a handmade piece, and with today’s selection of colors in yarn, making a striking, unique piece is likely, but not simple. Many years ago, I attempted this fascinating look in crochet. It was all in my head how I would accomplish this awesome looking arrangement of color. Though my sample came out fairly well, it was too difficult and took too much time (I think I made an entire three rows – phew!). I now knew that I could do it, and that was good enough for the time being. I had no intentions of making a functional item with this technique – way too much work for me! Until today….. I don’t even know what possessed me to give this another try. I did a little research first to see what I could learn. 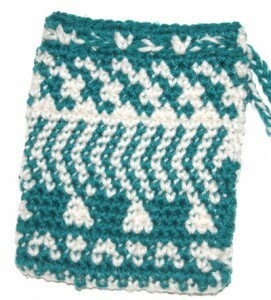 As far as the internet goes, there’s little information on Fair Isle CROCHET. If you knit, there are plenty of patterns and lessons available. Not so much for crochet though. I thought if I could figure it out on my own, I could pass down my new found information as a tutorial. Well, let me tell you what I’ve learned so far. 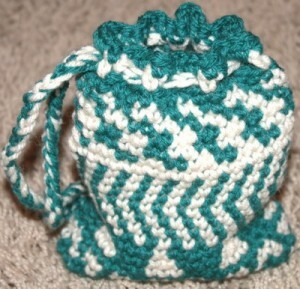 First I want to present my sample “Fair Isle Drawstring Booty Bag” (it’s empty because I have no, um, booty). Kind of funky looking patterns, I know, but it is, after all, a sample. This is what came out of about 6 hours of crocheting (keep in mind, I am an advanced crocheter, and normally something this size wouldn’t take but MAYBE a couple of hours). 1) This technique is not for beginners. There’s counting involved, and working with multiple strands of yarn makes counting to 2 (1…2) difficult! Switching colors back and forth and remembering a key rule, while remembering to join with a slip stitch, then single crocheting in the same stitch, blah, blah, blah makes one want to hurt someone. So, sorry. No beginners. 2) I began with two contrasting colors for the sake of good pictures (and working with more than 2 colors for this technique seems insane to me – you’ll see what I mean). Do not use more than 2 colors when you begin learning this technique. 3) I knew from the start that the simplest way to get the Fair Isle effect was to crochet in the round. You cannot turn your work, ever. Done properly, one side looks all pretty and patterned, and the other side looks like a 3 year old child’s attempt at weaving an Indian blanket. So the back side doesn’t get exposed, is what I’m trying to say. 4) If you want to make a flat 2 dimensional item (like a blanket), you have to crochet to the end of the row, end off, then go back to the beginning of the row and join your yarn – FOR EVERY ROW – which is fine and looks great if you want a blanket with LOTS of fringe. I’m trying to learn Fair Isle because I want to change colors without all the tying and weaving in loose ends – that’s the beauty of the whole thing. So the blanket thing won’t work for me. Unfortunately, the only books I can find on Fair Isle Crochet only contain afghan patterns! Ugh! 5) Switching colors back and forth during Fair Isle Crochet creates a spiral entanglement of yarn behind your work that forces you to stop every 10 stitches or so, where you must let your work hang in mid air, while pulling and separating your 2 yarn colors before you go on to your next set of 10 stitches. You spend a lot of time with your work hanging in the air. You see, your fingers act as a weaving loom. One finger goes up, you count and use that color of yarn, that color goes down and behind the second color so the second finger comes up so you can finish your stitch. Finger up, crochet, finger down, yarn back, finger up, crochet, finger down, yarn back. It’s absolutely crazy! Can you even imagine this with 3 or more colors? 6) This technique, when using medium worsted weight yarn, makes an incredibly THICK fabric! Think about it. It’s like crocheting with a double strand of yarn (there’s the stitch in the front, and then the “carry” yarn is in the back). The insulating properties of an item made like this are incredible! But it’s also really stiff. The bag in the example is standing on its own without being propped up. I would highly suggest using a sport weight, or sock yarn, if you were making a wearable item. Otherwise you’ll feel like you did when you were 4 – when your mom dressed you to go out in the snow with 3 sweaters and a large insulated jacket and you couldn’t move! 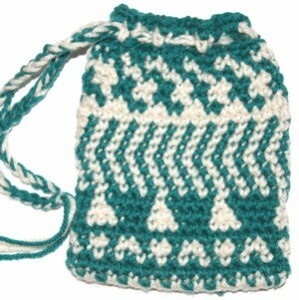 Fair Isle Crochet Bag – Thick enough to stand on its own! 7) I used only single crochet in my sample project. I’m sure you can use whatever stitch you like, but I’ve only tested in single crochet because I like the smaller, more detailed look. 6) Use a light weight yarn if making something wearable. This technique makes a very heavy fabric. 7) This can probably be done in any crochet stitch, but when just learning, single crochet is probably easiest. That being said, this is actually fun once you get the hang of it. It was fun trying different patterns (1 sc for each color – 2 sc of each color – crocheting on top of the opposite color, etc.). I never knew what the pattern was going to look like until I crocheted a few rows. This technique is the only way to achieve this whole look and it’s exciting! There are patterns out there – they’re just not specified as Fair Isle Crochet patterns. Look for cross stitch needlework patterns or even Fair Isle knitting patterns. Even bead loom patterns will work. They’ll look slightly different in crochet because there’s a slight “tilt” to the left or right when crocheted. I’m sure I’ll be attempting this again. I can picture some really awesome hats in this style. But for now, I need to go figure out how to get some booty in my bag! I’d love to hear your comments and feedback on this project! Have you ever or do you now create Fair Isle Crochet? This entry was posted on Friday, November 9th, 2012 at 8:37 AM by Corinne Munger	and is filed under Fun Ramblings, Tutorials and Help. You can follow any responses to this entry through the RSS 2.0 feed. You can skip to the end and leave a response. Pinging is currently not allowed. i just adore that print,reminds me of my hippie days.I have a ? I’m not sure where to ask .I realy need help.i have old yarn some 5yrs,hubby says older.i pretty much packed it good. long story short,i helped my mom for 3 or so years.just before she passed. i was diagnosed with multiple sclerosis.i may be a hoarder also LOL. i wan’ted to find out if it is still good.i don’t think so i’ve gotten like gnat bites,i’ve been using new yarn now. what do you think?i feel terrable about it. i love this spot i don’t type much but i enjoy reading every bit here. Sometimes certain fiber will attract some insects. I, personally, would just get rid of the yarn that may be infected – it’s not worth the bites! Thanks for joining us on crochetspot.com! I hope you’re enjoying all that we offer. This is so cool! Haven’t crocheted in a long while, and I’m probably not good enough at it to try this anytime soon, but I’m going to start up again and practice so when the time comes, I’ll be ready! Phew, that was a LONG sentence! Anyways, that is a beautiful bag, I love it! I hope you find some “booty” to put into it! Thank you, Olivia! It was a challenge to make, for sure! And I, too, hope I find some “booty” – ha ha ha! This is great! Would you possibly be working on a tutorial on how to do this? I’m always trying to expand my crocheting techniques and I’m liking this one very very much! Btw, for a first time attempt I’m loving the bag you made!! Hi Lane, As far as a tutorial, that would be pretty difficult for me as I am just learning and not even sure I’m doing it right. What I did was just start with 2 strands of different colored yarns. The yarn you’re NOT using, stays int he back of the piece you’re making. When you’re ready to make a stitch with it, simply pull it up from the back and put the other color towards the back. Try to keep the “carry yarn” – the one in the back – straight so there’s no loop. Just try it and have fun. Even if you just make a few rows, you’ll learn something. Then when you’re REALLY bored (LOL) you can actually try to make something. I would definitely stick to something circular though. Good luck and let me know how it comes out! I would do that in tapestry crochet. That has a prettier backside and no strands on the side. But surely makes a much thicker and not so soft fabric. So, I did a lot of research this evening and watched a bunch of videos on tapestry crochet – thank you so much for mentioning this! I think that way would be MUCH easier than what I attempted to do and I really think it’s something I’m going to be involved with! Thanks again for your input – that’s what makes sites like this so fantastic! Fair Isle crocheting is much easier if you crochet over the yarn rather than carrying it. You can use any graph to do it. Doing it with 2 colors is definitely the easiest. The important thing to remember is that when you are going to start your next color, you finish your current stitch with the new color; i.e., you are using turquoise and white in single crochet. Your next stitch is white. You catch the yarn for the first part of the single crochet, then pull through white. 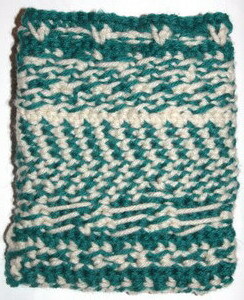 Do you white stitches, then on the last stitch, catch the white (2 loops on hook) then pull through with turquoise. You do have to stop every now and then and untangle. If you carry the yarn you can turn your work. If you want to do many colors, tunisian is easiest. You create small balls of color for each color change. I have small, plastic yogurt containers with a hole in the lid to hold them in. I have also done some color work by crocheting over and it worked out nicely and created a neat shaded stripe at the bottom of each row due to my large hook size. i have done up to five colors this way, during exams when i was stuck in the cafeteria for about four or five hours, i created several free form bowl type things. this is also where i practiced blind crochet just for something different to do. Susan, I don’t understand what you mean by “crocheting over the yarn” for Fair Isle crocheting. Can you please tell me a little more? Oh, sorry–I figured it out. “Crocheting over the yarn” is what I learned in knitting as “carrying the yarn.” I am crocheting an afghan now with a 2-color change. At this point, I’m not sure if carrying the yarn will work–I don’t like the other color showing through at the bottom! I am looking forward to learning more in this blog! And the teacher becomes the student…………. Thank you to Susan and Jazzy. These suggestions help a lot! I’d never even heard of tapestry crochet before so with some research, I learned that I just may have to take this new technique on. And Susan, I’ll look further into the Tunisian technique. I’d only ever done solids. Can’t wait to try them! Thanks so much, Ladies! I too have tried colorwork in crochet and it is indeed difficult. I agree with Susan that it is easier to carry the unused yarn all the way and to thus crochet over it. This covers it even tho’ at times you do see a slight “something” shining through. That’s part of the beauty. I crocheted a pillow front, a square 12×12″ with a square in the middle. Simple right? It was still difficult because the inside square must be perfectly square; otherwise, you’ve got a wonky square that screams “amateur”. Then, I went back and embroidered little slash marks on the inside square in the image of a skeleton. I’m now thinking of what to do for for the back side of little cushion and also perhaps an edging. How interesting that in my first newsletter from you you have a story on fairaisle crochet. Just this week I am attempting my first even crochet fairaisle, a pair of scandinavian elf like slippers, the feet and red and white and the cuff green and white. So far I am halfway through one foot, (about 8 hrs work) and going crazy. Nice! I’ve been tapestry crocheting for forever, but I never thought of using knitting patterns. Right now I’m making a tapestry scarf out of a vintage fair aisle pattern, and it looks amazing! I’ve done some tapestry crochet. Nobody seems to have mentioned yet, that the “tangling” problem can be eased by being careful which way you drop/pick up colors. If using 2 colors, always drop the dark color away from you, and the light color towards you (or vice versa), and they won’t get tangled. Or, always drop everything back for, say, 10 color changes, and then drop everything foward for the same number of changes. When dropping the old yarn back (away from yourself), reach under it to pick up the new color, so the strands twist together and no open spaces form.